What is a refugium? Is it a placed for sick fish? Live food??? If you want to send me to links that explain that would be great. I need to do something witht the LR I removed before I kill it. I've heard I can place it in the chambers of my 12GNC, but not sure why or how. Well a refugium is only like an extra filtration were there is some plants that will consume nitrates of the water ..but also required light... just that and well some put LS to it... Here are some refugium pics..
Another function of a refugium is to provide a separate area (apart from your main tank and any predators) to give pods and other lower end of the food chain critters to reproduce and create a source of live food for your tank. 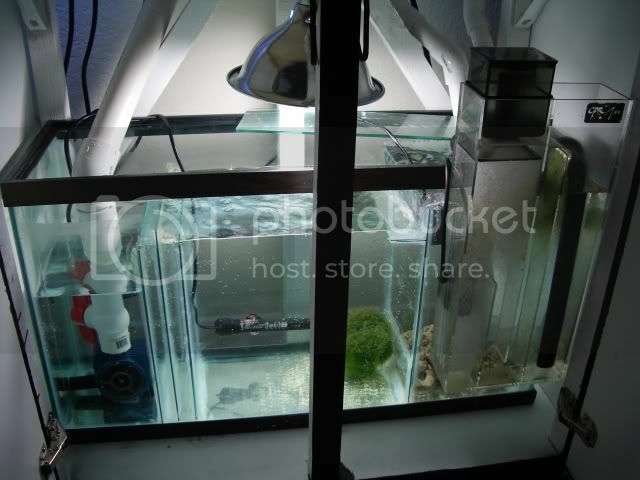 Ideally, the refugium should me mounted above the aquarium and allowed to overflow peacefully into the main tank. This way, live food won't have to go through a pump impeller before it enters the tank. Most people have their refugiums under their tanks though, since the elevated fuge is a little trickier to conceal. Hi guys, fairly new to saltwater... about 2 months. Got a 215L (57Gallons) second hand set up which was used as a fish with live rock only. Only 3x T8's in the hood. QUESTION: I really want to attach a small 20L (5.5Gallons) tank next to the big tank with separate MH and/or compact fluro/moonlight above the little tank so i could grow corals and keep inverts. I'll put a pump from this tank to the big tank and vice versa to circulate the water. This would mean that the little tank would be using the filtration etc as the main tank and (hopefully) keep the temp low in the nano. Sooooooo, the question, is this considered a nano tank or a refuge? and if your feeling chatty, maybe u could advice me of the smartest way of keeping the water flowing from the little tank to the big tank WITHOUT drilling holes in either tank AND what problems this kind of set up may pose before i throw even more money at my tanks. PS: my tank loves money being thrown at it, i am considering getting it its own bank account. I know u all totally understand this.